Over the past two weeks, the local SAPS Cluster Office initiated various roadblocks on roads heading out of Mkhondo and numerous successful arrests were made and fines issued. During this roadblock, one person was arrested for being in possession of dagga and nine traffic fines were issued. On Friday, 18 May 2018, another roadblock was conducted on the Driefontein Road by the Department of Home Affairs and the Local Traffic Department. During this roadblock, the Traffic Officers handed out eight traffic fines and the SAPS arrested three people for possession of dagga. During this roadblock, two people were apprehended for illegal possession of dagga while nine fines were issued for various offences, including the expiration of business licences. 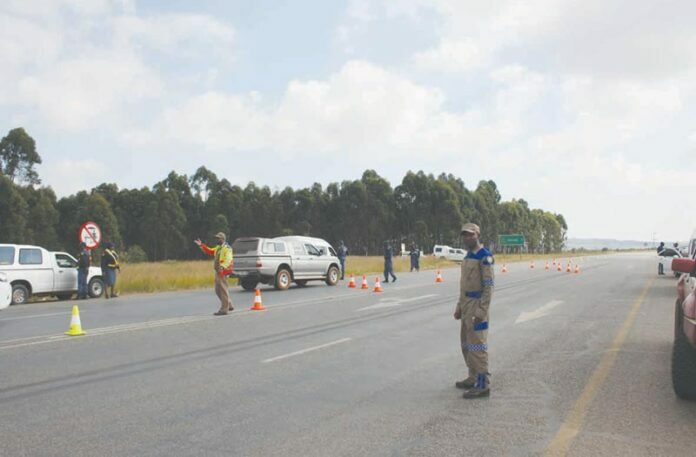 On Friday, 25 May 2018, the Local and Provincial Traffic Departments, together with the local SAPS, conducted a roadblock on the N2, at the Paulpietersburg turn-off, underway to Pongola. The SAPS successfully arrested two individuals for being in possession of dagga and the Traffic Departments issued eleven fines for traffic offences. Congratulations on these successful roadblocks and thank you for working hard to keep individuals off Mkhondo’s roads who do not abide by the law. Next articleKan jy die vloedwaterafvoer struktuur sien? Armed robberies, murders, road rage . . .